Today I am beyond excited to have my good friend and mentor, Billy Keels, joining me on this week’s episode. Billy is an American citizen who lives in Barcelona, Spain and INVESTS in the United States. Even though he already has a successful career in the technology industry, Billy was looking for ways to replace his current income with passive income to spend more time with his wife and two sons. 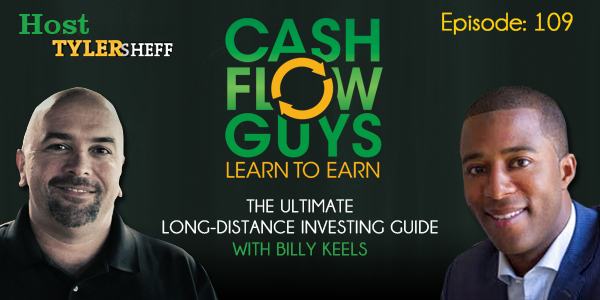 It was Billy’s boss who initially showed Billy that long distance investing was viable. Billy initially wanted to invest locally, but quickly found out, however, that European charm came with a hefty price tag. He couldn’t find any deals in his local market that made sense! Then he realized, “Wait, I’m an American, I can invest in America!” and did just that. Billy says “Appreciation doesn’t pay my bills,” and focuses on generating cash flow in every single one of his deals. Initially, he selected cities where he had family in who could check in on the investments every so often but quickly learned that wasn’t the best strategy for building his portfolio. Next, Billy decided to create teams in areas that showed great potential and who could take care of the tenants efficiently. Once he had those teams assembled, he knew he could take on any opportunity that came his way. Make sure you check out Billy at GrowYourMoneyTheSmartWay.com and download his FREE ebook! You’ll also find fantastic informational videos on his website, KeeponCashflow.com.